But for some, a clean car is romantic. Or a cemetery plot. A hedgehog sculpture is one of the gift options at Mahoney&apos;s Garden Center in Winchester. Whether he knows it or not, Laura Newcomer’s husband can bypass the roses and jewelry this week. All she wants for Valentine’s Day, says the New England transplant now living in Seattle, is to have her kitchen knives sharpened and her car detailed. Sharp knives may not be the first image to come to mind when you think of Valentine’s Day, but in this time of conscientious consumerism, more and more adults are leaning away from traditional gifts and toward practical, unique, or genuinely appreciated tokens to express their love. After all, both diamonds and flowers alert some people’s environmental and sociopolitical concerns. Not so with a good interior car cleaning. And Newcomer isn’t alone in her wishes, according to Alex Jarvie of Driven Perfection in Weymouth. With more than a decade of experience in the car-detailing field, he definitely sees a small spike in business around Feb. 14. There are lots of ways to make your Valentine feel special while still being practical, agrees Sean Curry, who owns Ace hardware stores in Quincy, Braintree, and Hanover. Women who visit his stores around this time of year are often drawn to the Big Green Egg, an eye-catching outdoor grill; or perhaps a smoker for their barbequeing sweetheart. But while always happy to make a sale, Curry doesn’t like to see a customer make a mistake. Instead, Curry might suggest the trendy Yeti insulated drink cups, which come in a variety of floral hues. And just to cover all the bases, he keeps a display of roses near the cash register during Valentine’s week as well. 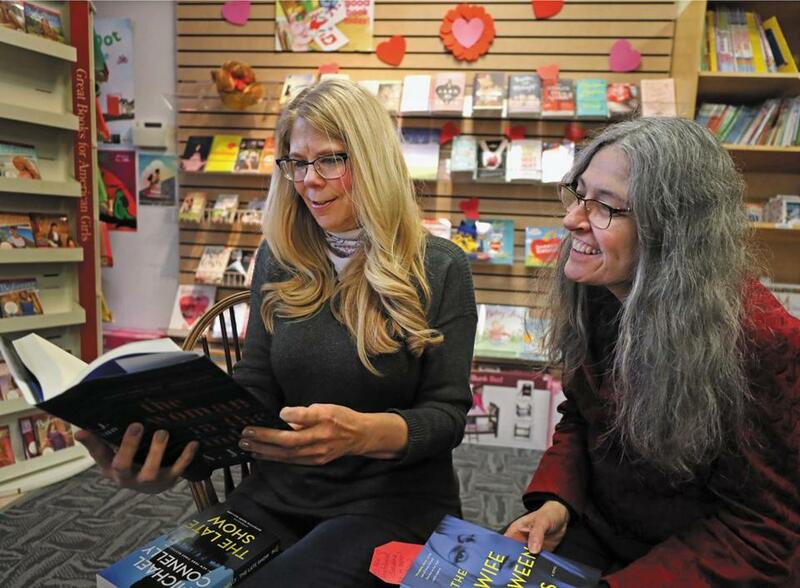 Booksellers Joey Jackson Mitchell and Janet Bibeau at Storybook Cove in Hanover get ready for Valentine’s Day. The somewhat nontraditional gift that Ashton Rico picked out for her husband last year was a hit, Rico recalled while eating lunch at the Burlington Mall recently. She gave him a small countertop fryer, and “he was like a kid on Christmas morning” as he considered all the culinary possibilities for his new toy. But nontraditional gifts don’t need to be as unromantic as tools or hardware. Customers who visit any of Mahoney’s Garden Centers’ eight locations in search of something other than flowers are greeted with lots of Valentine’s-appropriate options, said marketing director Emily Covino. Some buy birdfeeders, because “watching birds on a winter’s morning is something romantic that couples can enjoy together,” she said. Culinary herbs grown in small windowsill pots encourage couples to cook together. Others seek out statuary that reminds them of their pets or connotes a religious figure with special significance to them. Reading together is also romantic, points out Joey Mitchell, bookseller at Storybook Cove in Hanover. She encourages couples to buy each other books — whether bestsellers or love poems — and is happy to make recommendations. 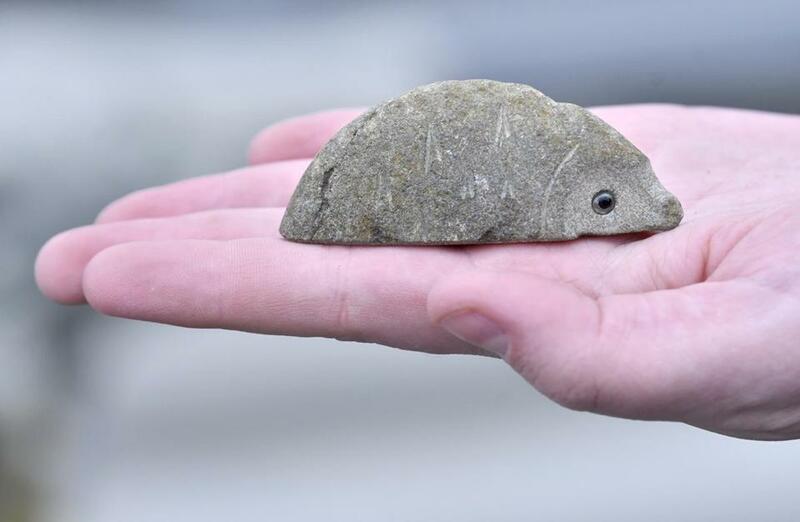 Also popular at this time of year are the small smooth heart-shaped stones she keeps near check-out. “Boys like to buy those for their moms,” Mitchell commented. 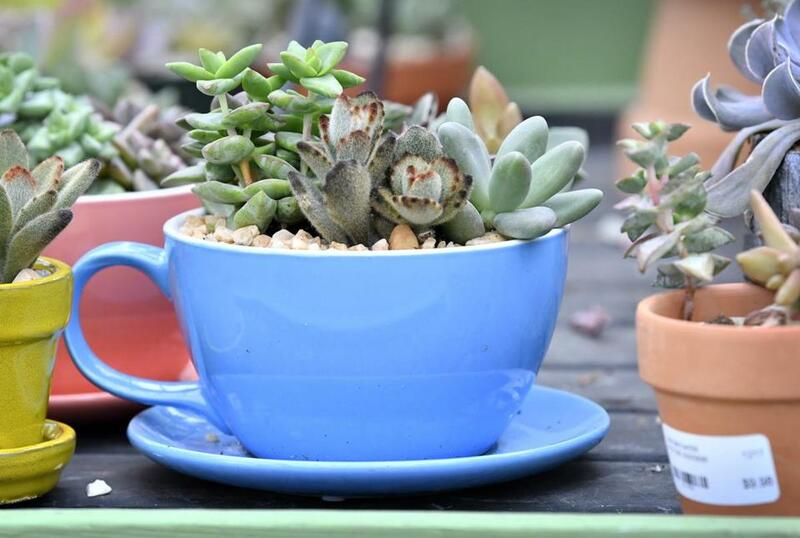 Have a cup of — succulents? A panoply of gifts are available at at Mahoney's Garden Center in Winchester. Karen Pfautz of Concord remembers the gift she gave a boyfriend back when they were both MIT undergrads. To underscore her emphatically nonromantic tendencies, she made a trip to Blood Farm in Groton and purchased a beef heart, which she placed in a heart-shaped candy box. “He cooked it and served it back to me with edible flowers!” Pfautz recalled. In general, men seem more likely to go with the traditional jewelry or floral arrangements than to go out on a creative limb — and Larry Bearfield, proprietor of Ferns Country Store in Carlisle, thinks he knows why. “No guy is going to take the risk of being unromantic on Valentine’s Day,” he said. Indeed, Jessa Best of North Billerica would probably agree with Bearfield’s perspective. On their second Valentine’s Day together, Best’s boyfriend gave her a Dustbuster and encouraged her to clean her car. A month later, they broke up. “I gave the Dustbuster to my mom and bought WeatherTech floor mats to keep my car clean,” she said. But isn’t there a point for some couples where they have been together for so long that romantic gifts might seem like a thing of the past? Don’t try to tell that to Margaret Darling, a piano teacher in Carlisle who last year chose what she considers possibly the most romantic gift of all for her husband, Eric: a shared burial plot in which they plan to someday have their ashes interred. She presented the unusual gift by wrapping up the deed to the plot along with some photos of it. 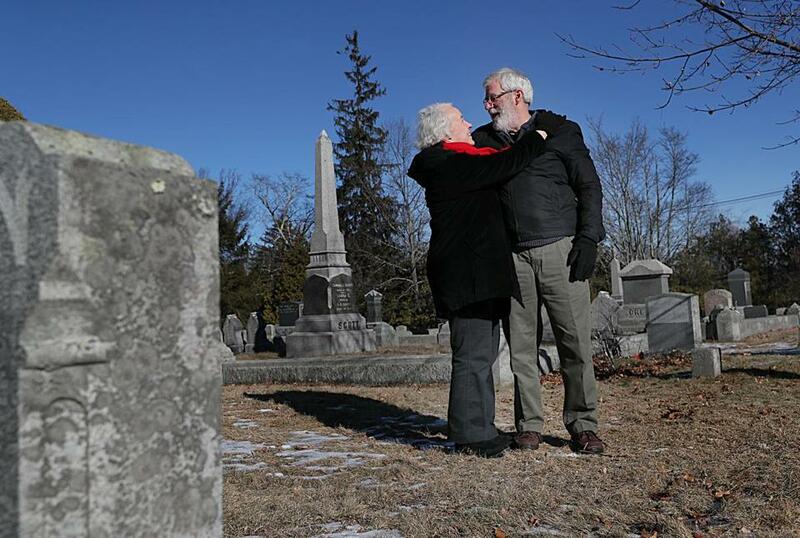 Margaret Darling gave her husband, Eric, a cemetery plot for Valentine's Day. Nancy Shohet West can be reached at nancyswest@gmail.com.